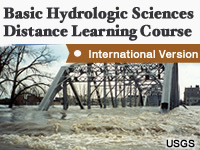 Developed for an international audience with a broad background, this course is designed to address the needs of non-hydrologists who work with hydrologic data, particularly in flood forecasting. The course provides an understanding of the complex interactions between the ground, waters and atmosphere, and will prepare the student for further study in hydrologic methods and forecasting. The course is based on materials originally developed for NOAA forecasters, but adapted so that the topics presented include a variety of hydrologic forecast methods applicable to a audiences in varied locations. All units are presented in the International System of Units (SI). The goal of this course is to provide students with knowledge of basic scientific concepts underlying hydrology and to develop fundamental skills in hydrologic forecasting within a broad framework that is applicable to most locations. The resources below are applicable to the core foundation topics.